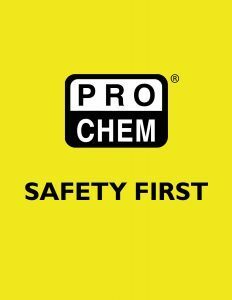 THIRSTY | Pro Chem, Inc.
THIRSTY works quickly to absorb, solidify and deodorize potentially hazardous liquids. It absorbs liquid at the rate of 100 times its weight in seconds. 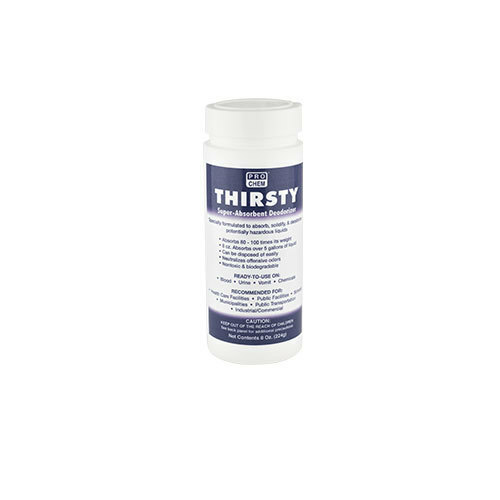 One container of THIRSTY will absorb over 5 gallons of liquid, thereby eliminating the need for mops, towels and rags while it neutralizes virtually all types of odors. It can be used on vomit, urine, blood, numerous different chemicals and virtually any liquid. Safe to use on carpet. Put on rubber gloves and other protective clothing as required. Sprinkle THIRSTY over spilled fluid until completely covered. When liquid is congealed, remove with dustpan and broom. Disinfect area if necessary.